If you’ve ever wanted to AirPlay a video from your Mac or PC, you’d know it isn’t always straight forward. AirFlow by Bit Cave is here to cater to your streaming needs and make it much, much easier, and it does so flawlessly. Check out our review of AirFlow after the jump. Normally, if you had an .mkv file or another non-iTunes friendly file, you’d have to convert the video to .mp4, .m4v or .mov, which takes anything between 30 minutes to 2 hours, depending on how powerful your computer is and how long the video is, then you’d have to open it in iTunes and AirPlay it to your Apple TV, that’s assuming you’re using a Mac. If you’re on Windows, you’d have to jump through even more hoops, you’d either have to buy a video converter (or use a free one), convert your video, then add it to iTunes and access the video through the Apple TV’s Home Sharing option OR buy a complete desktop mirroring software, that mirrors your whole screen to your Apple TV (after messing around with servers and confusing settings) and even then the video won’t be very crisp. There are softwares like Beamer, but they are either for Mac only and/or won’t be able to stream high bitrate movies (movies with sizes of 20GB – 40GB). 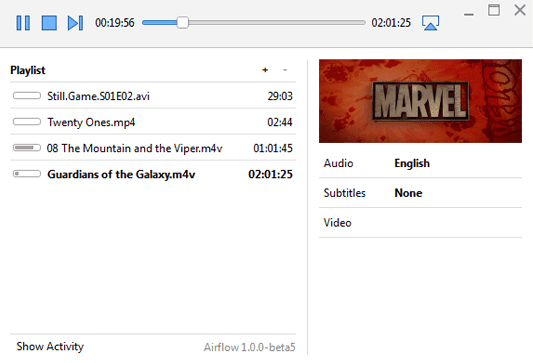 AirFlow will play just about anything you throw at it, any format, any size, it is that good. 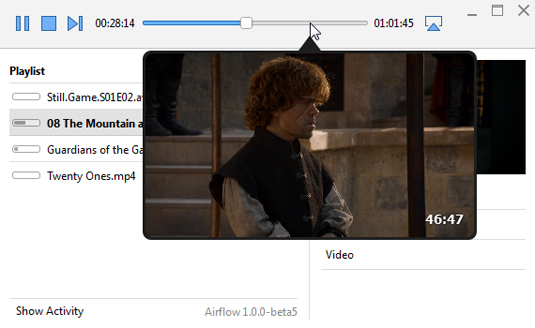 The best thing about AirFlow is that it works with Mac and PC and is extremely easy to use, simply drag and drop your video files into AirFlow and press Play. If you’re looking for a way to stream any video file from your Mac or PC to your Apple TV, I cannot recommend AirFlow enough. You’d have to try it to believe it. What are your thoughts on AirFlow?